Point number 1 is the way in which we procure our energy (mining/drilling fossil fuels or deploying solar panels and wind turbines) and point number 2 is the way in which we make this energy useful to society at higher levels of penetration (refining fossil fuels to electricity or smoothing out the intermittent surges of renewable energy). Without point number 1, point number 2 cannot exist and without point number 2, the energy procured in point number 1 cannot sustain a complex society such as ours. Thus, if renewables are to challenge fossil fuels in an open market, technology must advance to the point where renewables can compete under both these points. This article will examine whether this is in fact possible. 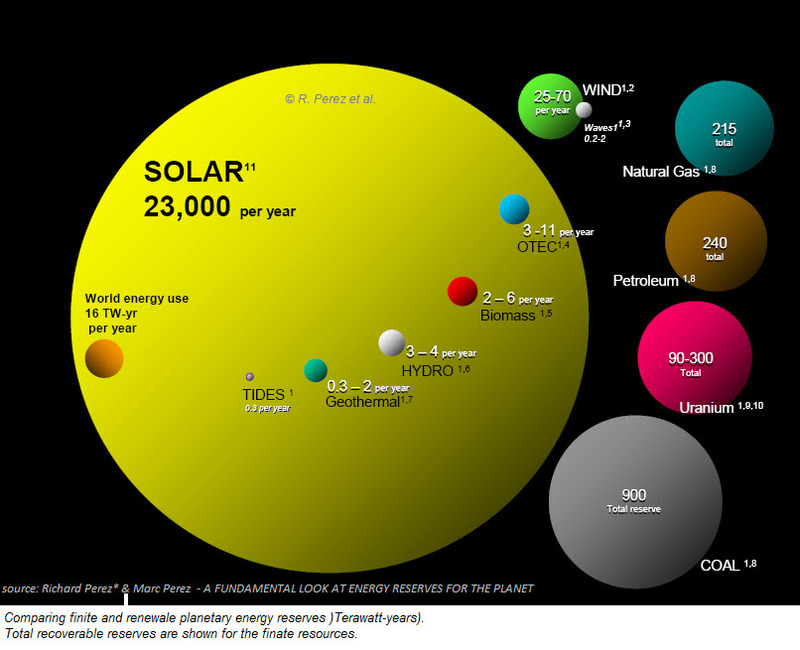 Renewable energy advocates often point to the total energy fluxes of the Earth (below) and proclaim that renewable energy resources are essentially boundless. Yes, it is true: we are surrounded by incredible amounts of diffuse renewable energy (e.g. solar radiation and wind). Unfortunately, however, this energy is useless to us unless it is concentrated into forms such as electricity or fuels. The reason behind this is called the second law of thermodynamics which states that energy must flow from a concentrated form to a more diffuse form in order to do work. Our entire society was built on the work performed by liberating concentrated fossil energy to diffuse heat and, in order to compete, renewable energy technologies also need to deliver such concentrated energy. Now there is no question that renewable energy can be sufficiently concentrated by solar panels and wind turbines. The only question is whether this can be done more cost effectively than simply digging already concentrated fossil fuels out of the ground. This challenge is two-fold. Firstly, energy does not like to be concentrated, hence the fact that the average commercially available solar panel is only about 13% efficient. And secondly, because the energy source is so diffuse, vast areas need to be covered in order to harvest this diffuse energy. The video presentation below gives a very informative discussion on the areas we are talking about here (it’s long, but definitely worth the time). As a result of this challenge, it was previously calculated that the solar panel price needs to fall to about $0.31/W installed in order to compete with coal at $100/ton. It is therefore clear that installed solar prices still need to fall about one order of magnitude before we can see a sustained market driven displacement of coal by PV. Is this possible? Well, the most optimistic projection in the OpenEI database sees solar PV levelling off at about $1.44/W installed which is more than quadruple the required level. Perhaps we will be pleasantly surprised by some technological miracle in the medium-term future, but achieving the required prices with current PV technology will unfortunately be completely impossible. If intermittent renewables like solar and wind are ever to contribute a sizable portion of our global energy mix, a large amount of additional infrastructure will need to be deployed in order to counter the large fluctuations in output varying over timescales ranging from seconds to years. As an example, the variability of wind generation in Germany for 2012 is shown below. On a countywide basis, the output varied over more than two orders of magnitude from a minimum of 0.115 GW to a maximum of 24 GW. It is clear that a large amount of extra infrastructure will be needed in order to smooth out this erratic output to something that better resembles the demand profile. Solar PV is of course even worse because it generates no power whatsoever for the majority of the time and delivers most of its energy in the few hours around noon. Again, there can be no doubt that we have a wide range of technically proven solutions to this problem. When just looking at the area of energy storage there are many proven ways to store energy in chemical, kinetic and various potential forms. But again, the challenge is to deploy these solutions at a lower cost than that involved in the refinement of fossil fuels. A coal power plant is the most expensive kind of fossil fuel refinery. For example, a standard coal-fired power plant must sell electricity for about $0.06/kWh, but coal at $100/ton costs only $0.015/kWh. The remaining $0.045/kWh represents the price of refining coal to electricity and arises primarily from the low efficiency and high capital costs of coal plants. So, how does energy storage compare? Well, a recent test of lead acid and Li-ion batteries found that these technologies could store energy for about $0.34 and $0.40 per kWh over their respective lifetimes. Hence, we again have to conclude that the most ideal renewable energy storage solution is still about one order of magnitude away from challenging fossil fuels on a level playing field. The Li-ion battery throughput cost of $0.40/kWh mentioned above was calculated for an initial cost of $600 per kWh of capacity. Most optimistic projections for Li-ion battery costs give longer-term prices at about $200 per kWh of capacity. At these prices, battery storage would be about triple the price of refining coal to electricity. Again, we need a technological miracle. So, these are the facts. In order for intermittent renewable energy sources such as solar PV to effectively compete with fossil fuels like coal, both the price of installed solar panels and the price of battery storage will need to reduce by a full order of magnitude. In addition, optimistic long-term projections state that both solar panels and battery storage will reach technological maturity at roughly triple the cost of their fossil fuel counterparts. Does this mean that it is fundamentally impossible for renewable energy to trump fossil fuels? 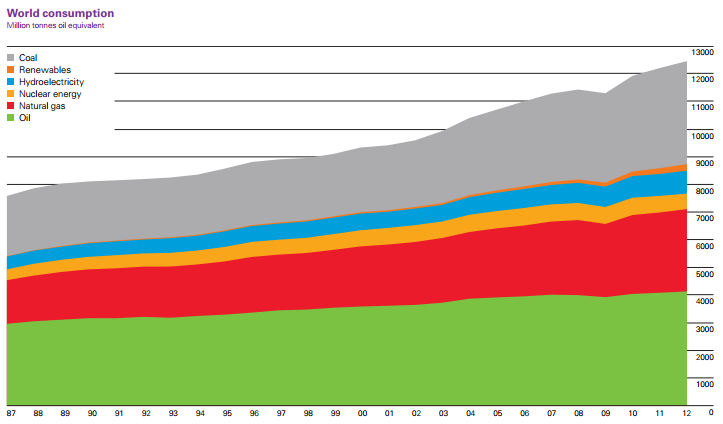 Well, I would stop short of saying that, but, from this analysis, it appears unlikely that we will see a large scale market driven displacement of fossil fuels by renewable energy in the first half of this century. In addition to direct energy storage in the form of water supply upstream (similar to that performed on any Hydropower) AirHP can easily be modified to increase its storage capacity is about 600 times! It’s enough to add hydrogen hose and to use ballonet aerostat, which in this case will not only ensure the maintenance AirHP elements, but also to keep a stock of hydrogen as an energy storage agent. It is easy to show that 1 kg of hydrogen (with a calorific value 120.9 MJ/kg) holds in the upper reach of about 10 kg of water with a supply of hydropower only 0.2 MJ. So on AirHP during overproduction of energy can always be by pumping hydrogen (produced by electrolysis at the bottom) and balanced drain to provide the necessary amount of water in the upper reach (to maintain steady-state design and minimize the tension holding the ropes) and magnified 600 times the amount of energy which, if necessary energy, can always be balanced so as to get back in the fuel cells (from hydrogen) and a turbogenerator (from water). By the way, you can still pick up on it and transporting hydrogen itself as a fuel in these airships, dirigibles transport such loads, etc. NB! Major trends in energetics are associated with the transition to renewable energy sources. It then becomes clear that resources are only sufficient for sun and (possibly) wind. Traditional hydropower does not have enough resources. However, the use of cloud energy changes this assessment. Principally it results from economics. All three methods of conversion (PV, wind, clouds) have the same order of magnitude of the energy density (~ 100 W/m2), but only for AIR HYDRO all this energy with virtually no loss can be merged into one point (pipe / turbine), making part of the proportional m2 far cheaper than for other alternatives. This implies the 1-2 orders of magnitude smaller the specific cost and Payback period that allows quickly rebuild the energetics and successfully avoid the collapse of climate & oil in 2050.